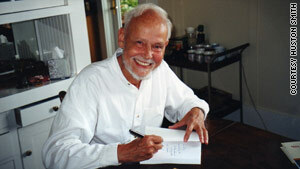 Huston Smith is considered one of the pioneers of interfaith understanding. Smith known for his "Wisdom of the Ages"
Smith says daughter carried him "to the furthest shore"
(CNN) -- Huston Smith sat at the bedside of his firstborn child, watching her life ebb away. "I have no complaints," Karen Smith told her father. "I am at peace." During their last moments together, Karen told her father that she was thinking of angels. She told him not to cry. She told him how much she loved the ocean. "Religion," Smith once wrote, is "the call to confront reality; to master the self." Smith had strived to answer that call for much of his life. He had trained with Zen masters in Japan, camped with aborigines in Australia and dropped peyote with Native American shamans. He didn't just study religions; he lived them. In time, Smith became known as the sage of world religion. He introduced the Dalai Lama to the West; befriended mythologist Joseph Campbell and was the subject of a five-part PBS series hosted by Bill Moyers called "Wisdom of the Ages." But as Smith sat at his daughter's bedside, the wisdom of the ages offered little consolation. "I would sob uncontrollably, crying in anguish," he said. Smith had to confront a new reality: Who does the sage turn to when he needs help? A hip has been replaced. He can no longer hear well. The man who has helped people find answers to their deepest spiritual yearnings now needs help just to get around. Smith, 90, recently moved into an assisted-living home after living with his wife, Kendra, for 66 years. Yet he whispers the same prayer to himself several times a day: "God, you are so good to me." That spirit of gratitude pervades Smith's recently released autobiography, "Tales of Wonder." In it, Smith talks about growing up as the child of missionaries in China, becoming enthralled by the faith of other cultures, and his global travels and friendships with everyone from folk singer Pete Seeger to author Aldous Huxley. He reveals the story behind his signature achievement: the publication of "World's Religions" in 1958. The book, which has sold 3 million copies, helped change the American religious landscape. In vivid and poetic writing, Smith took readers on a tour of the world's major religions. The book helped make it OK for Americans to not only learn about but be dazzled by other religions. Smith said he never stopped being a Christian ("God is defined by Jesus but not confined to Jesus"). But his faith has been deepened by his immersion in other religious traditions. "Anyone who is only Japanese or American, only Oriental or Occidental, is but half human," Smith wrote at the beginning of "World Religions." "The other half that beats with the pulse of all humanity has yet to be awakened." It is the pulse of Smith's humanity that breathes life into "Tales of Wonder." Smith's public persona has long been established: He is the tall, thin, affable scholar who can distill the essence of the most esoteric religious subject in concrete language. But it is those moments in "Tales of Wonder" when Smith doesn't have the answers that are the most riveting. Smith won't elaborate publicly on some of the more personal passages in the book. Nor will his wife. Only his youngest daughter, Kimberly, talked at length about those moments. Smith nonetheless had plenty to say when he sat down to write. He talked about the time when Kendra threatened to leave him. "There are infidelities worst than sexual," he said. He talked about the murder of his granddaughter, Serena, during a tragedy at sea that involved a famous NBA player and led to international headlines. The most searing revelations, though, come just four pages into the book. That's where Smith talks about the loss of the oldest of his three daughters, Karen, in 1994. Karen was born nine months after Smith married. He said her birth marked "my second love affair." Karen grew up in a home full of music, learning and fun. The Smiths staged mini-operas in their home. They filled notebooks with their children's funniest sayings. One night, the family played a game in which every sentence uttered at the dinner table had to contain a cliche ("That was easier said than done," said Kendra, Karen's mother). "We all grew up with a tremendous faith," said Kimberly, Smith's youngest daughter. "We all believed in an afterlife." Karen, though, also grew up with a "fiery" sense of self, Smith said. When she was 7 years old, Smith overheard Karen telling her sister in their room: "They talk so much about God. I don't get it." When Karen became a teenager, she informed her father that she would no longer attend church. He was aghast. "If Karen gave up religion, I thought, morality will go next," Smith said. Karen found a taste of her cherished freedom on the water. She loved being on the water; "it symbolized life to her," Smith said. Karen took sailing classes in high school and learned to windsurf. Karen eventually found religion again, but it was not the Christian faith of her father. She converted to Judaism after she was married and gave birth to Smith's first grandchild, a son, Isaiah. Then, after Karen reached her 50th birthday, she received a call from her doctor. She had recently had a hysterectomy. After the surgery, the doctor told her that tests had revealed something: She had a rare form of sarcoma and had two months to live, possibly four. Karen didn't accept the doctor's prognosis, said Kimberly, her youngest sister. She agreed to undergo chemotherapy. Her body shriveled, and her hair fell out, but Karen was defiant. Kimberly said she still has a photo of her sister -- bald and weakened from chemotherapy -- happily windsurfing. "She fought her hardest and pursued all the avenues of life she could," Kimberly said. Still, the cancer spread. The sarcoma tumors grew so large and concentrated and a needle couldn't penetrate them, Smith said. Karen was eventually confined to her home in Santa Rosa, California. Her sister Kimberly remembers visiting her. "When I drove up to see her, I kept saying to myself, 'I'm not going to cry,' " Kimberly said. "The second I walked in, I started bawling." Kimberly apologized to Karen, but Karen ended up consoling her and the rest of her family. "We were crying, and she was saying, 'It's OK to cry,' '' Kimberly said. Smith said his daughter battled "heroically." She once cheerfully told her father: "It's a red-letter day. I had a bowel movement." As Karen's body weakened, other senses seemed to sharpen, Smith said. She told her parents that as her body suffered, she became more aware of the natural beauty that surrounded her. She talked about angels. On one unforgettable day, the family took Karen on a drive through Napa Valley. The valley is wine country, full of creeks, wineries and fields of wildflowers. Smith called it a drive on "the last beautiful day in the world." The drive gave Karen new energy. That night, she was talking with her mother and husband for so long that they told her she had to get her rest. "But we're having such a good time," Karen said. Smith, though, was struggling. He said his daughter's illness forced him to call upon the spiritual traditions he had studied for much of his life. He thought about the "Five Remembrances" that some Buddhist monks chant each day: I will lose my youth, my health, my loved ones, everything I hold dear and, finally, life itself by the very nature of being human. Smith said those remembrances told him that the transient nature of life does not mean people should love others less but more. Smith then recalled a quote from Buddha: "Suffering, if it does not diminish love, will transport you to the furthest shore." Karen died one night as Smith sat beside her bed. Smith sobbed uncontrollably. He said that at the moment of his daughter's death, he had trouble believing in what he had long written about: God's "justice and perfection." Yet even when he was doubled over in anguish beside his daughter's bed, she seemed to be reaching out to him. As he sat alone with Karen's body, in the moments after her death, he suddenly stopped crying. He could somehow sense her presence in the room. "The sensation was so palpable I almost turned around, expecting to see her," he said. Smith said his daughter is still reaching out to him. He often thinks about her last days as he approaches his 91st birthday. "Nobody wants to learn from a child how to die well, but I learned it from Karen," he said. Smith traveled around the world to study under some of the most famous spiritual masters. But it was his daughter who became one of his greatest teachers. "She taught me nobility of spirit," he said. He said Karen's courage continues to "console" and "guide" him as he draws closer to his furthest shore. He can still hear Karen's final words as she slipped away in her bed. "I hear the ocean," she said. "I can smell the ocean now."